The gracious folks at H.B. Fenn and Company Ltd and Tor in Toronto recently sent me the 10th anniversary edition of Gardens of the Moon by Steven Erikson. This is the first book in his epic fantasy series Tales of the Malazan Empire. I have been reading and following Malazan for years and while I haven’t read them all, I am up to Reaper’s Gale and can personally recommend the series for those that love intense world-building, huge casts of characters and wildly inventive stories. Because I have read Gardens of the Moon and already own an earlier copy, I am going to have a Giveaway for this copy which is a great entre into the series. If you like it, just think eight of the ten books are already in print ready for you to devour. Leave a comment and tell us what fantasy book you would most like to see made into a movie. For an additional entry, add yourself as a Follower or subscribe to SciFiGuy.ca. Contest ends Midnight, June 14, 2009. I'll use Randomizer to pick a winner next Tuesday. Open to everyone, anywhere (at least on planet). 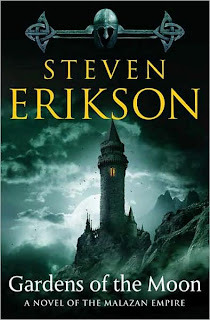 Steven Erikson is a pseudonym used by Steven Rune Lundin, who grew up in Winnipeg, Canada and currently lives in Victoria, British Columbia with his wife and son. He is an anthropologist and archaeologist by training and a graduate of the acclaimed Iowa Writer’s Workshop. His debut fantasy novel, Gardens of the Moon, marked the opening chapter in the epic Malazan Book of the Fallen sequence, which has been hailed as one of the most significant works of fantasy of this millennium. 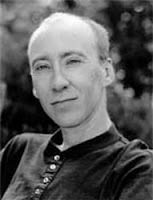 You can visit the Malazan website here and the Steven Erikson Wikipedia entry here. I'm relatively new to fantasy but since my introduction was 'Wheel of Time', I'll choose that as the one I'd like to see in a movie theatre. And since that series was mammoth (and unfinished!) I'm not so scared to start a new one. 'Gardens of the Moon' sounds great. Since I recently review Vicki Pettersson's City of Souls and it's still so fresh in my mind, I would have to pick the Sign of the Zodiac Series. I just can't think of a series that would better translate to the big screen or TV. It would be an action packed fantasy adventure. It might also be neat to see it sort of like they did Sin City..sort of live action anime. I'm sure you know that Scent of Shadows is the first in the series. I think this would be too cool. And of course, I already have this contest posted on my blog @ http://myblog2point0.blogspot.com/. I have the BOOK for a movie: Jonathan Strange & Mr. Norrell by Susanna Clarke. I love this book. I would like to see The Silmarillion made into a movie. There's way too many great fantasy series to pick from. My favorite is Sharing Knife series by Lois McMaster Bujold. Not so sure if it would make a great movie, but I'd love that series in any form. Hmmm, fantasy movie I'd like to see turned into a movie. If done right and not turned into the normal hollywoodized crap I wouldn't mind seeing "American Gods" on the big screen. I think Abercrombie's "The First Law" trilogy would be a great movie. Thanks for organizing this giveaway: rpgdnd (at) gmail (dot) com. I'm also a follower on your blog. I gotta say gaby317 beat me with saying the Codex Alera with Furies of Calderon as the first. I just finished Princeps Fury, and every book just keeps dragging me in further and further. Love the series. A book I'd love to see made into a movie is WARBREAKER by Sanderson. I'd love to see the Dark Jewels trilogy (Anne Bishop) turned into movies. That would be something absolutely new. If it were done well, I think I'd like to see a movie version of Naomi Novik's His Majesty's Dragon. I'd like to see Stephen King's The Dark Tower series as a movie. If that doesn't count, then I'll choose Guy Gavriel Kay's The Fionavar Tapestry. Following now. Vote number three for The Furies of Caulderon - LOVE this series, can't wait for the final novel! However, I think the first Kushiel's Legecy trilogy would be a very original movie experience. I am a follower! Great blog! Oh my gosh - one of the best ever would have to be William Hope Hodgson's HOUSE ON THE BORDERLAND!!! I'd love to see the Mediator Series by Meg Cabot turned into a movie. I think the Sookie Stackhouse series by Charlaine Harris would make an awesome series of movies! I would love to see Anne Bishop's Black Jewels trilogy made into a movie. Would love to see Artemis Fowl! I am new to fantasy novels but would love to start getting into them. So as of yet I have no favorite that I would like to see made into a movie. OK Hollywood are you paying attention? So far a great list of original properties that would make terrific movies. No rehashes, redoes or reboots. Some studio or director please step up to the plate! I would love to see any of the Anita Blake books made into movies. The Enduring Flame series by Mercedes Lackey would make a great movie. I woudl also like to see the Dark Tower series as a movie. Or the Percy Jackson & The Olympians books. I'd like to see Vampire Academy by Richelle Mead and THe Mortal instruments by Cassancra Clare turned into movies! I would love to see the Dark Hunter series by Sherrilyn Kenyon made into a movie! Thanks to everyone that entered. Lots of great suggestions. Congratulations Michelle G you are the winner!